The SEMAINE project is under development by an international team of scientists. The intent is to create a Sensitive Artificial Listener (SAL) system, which will look at the non-verbal cues of its human users to determine responses. 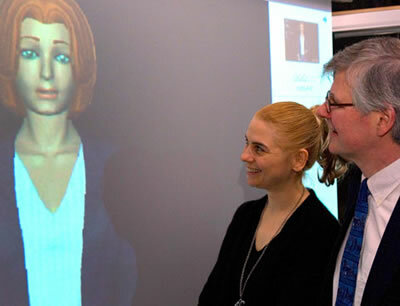 SEMAINE (Sustained Emotionally coloured Machine-human Interaction using Nonverbal Expression) is led by DFKI, the German Center for Artificial Intelligence. Professor Roddy Cowle leads the team at Queen's University Belfast. "A basic feature of human communication is that it is colored by emotion. When we talk to another person, the words are carried on an undercurrent of signs that show them what attracts us, what bores us and so on. The fact that computers do not currently do this is one of the main reasons why communicating with them is so unlike interacting with a human. It is also one of the reasons we can find them so frustrating." “SEMAINE and projects like it will change the way people interact with technology. They mean that you will be talking to your computer in 20 years time. When you do, pause for a minute, and remember that the human sciences at Queen’s helped to lay the groundwork. Science fiction fans have seen this future before, with remarkable specificity. In his wonderful novel 2010, Arthur C. Clarke writes about the successor to the famous HAL 9000 computer that went to Jupiter in 2001: A Space Odyssey" - the SAL 9000. The console was never switched off; [Dr. Chandra] checked that no messages were flashing importantly on the display, then spoke into the microphone. "Good morning, Sal. So you've nothing new for me?" "No, Dr. Chandra. Have you anything new for me?" The voice might have been that of any cultured Hindu lady educated in the United States as well as her own country. Sal's accent had no started that way, but over the years she had picked up many of Chandra's intonations. ...No matter that Sal did not really understand more than a fraction of what he said; her responses were so convincing that even her creator was sometimes deceived. Take a look at the future of computer/human interaction in this scene from the movie version of 2010. Read more at Conversations with Computers (press release).